Norway is the latest arena where debate about the impacts of gambling machines has heated up. Based on the most reliable information available, Norway is unique in having numerous and widely dispersed gambling machines and the lowest problem gambling prevalence rate identified internationally. Until recently, there were nearly 20,000 gambling machines in Norway, a country of 4.5 million. 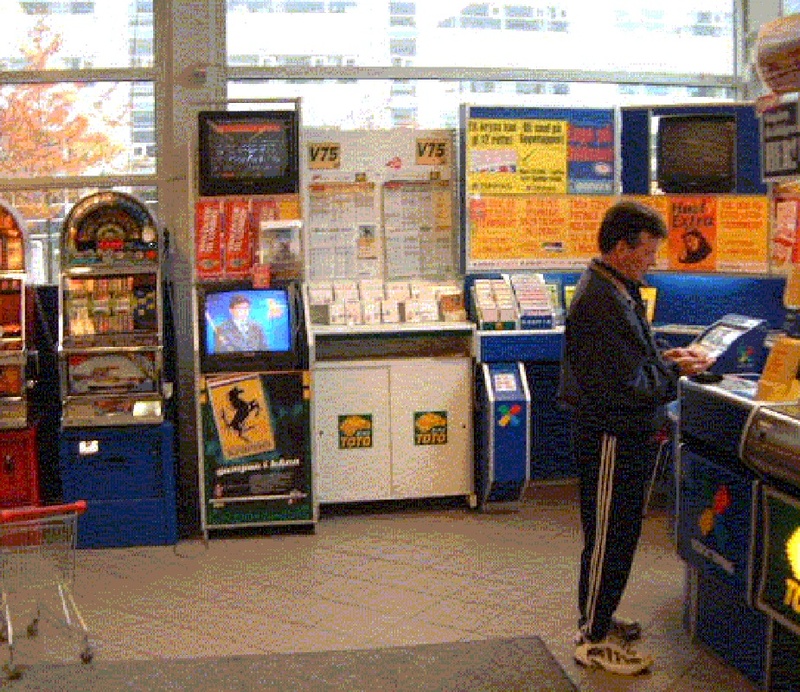 These machines, located in shopping malls, grocery stores, convenience stores and gas stations, were limited to only one or a few machines per venue with proceeds dedicated to humanitarian organizations, sports clubs and other benevolent causes. The gambling machines in Norway are generally located in full view of members of the public and lack seating and other amenities to encourage long sessions of play. As this photograph shows, the machines are often co-located with other types of gambling, including the national lottery, horse-race betting and sports betting. In 2000, the Norwegian Government made changes to bet limits and prize structures of the gambling machines which led to a rapid increase in gambling machine revenues. In the wake of this increase, gambling machines became a significant political issue in Norway. In response, the Norwegian Government passed a law in 2003 to completely change the gambling machine regime. The law passed by the Norwegian Government included a number of measures. The most significant change was a proposal to nationalize the entire industry and place it under control of the Government’s lottery and sports betting operator, Norsk Tipping. Other changes included reducing the overall number of machines and banning the use of note acceptors – measures that have already been implemented. restricted locations where alcohol is served (with up to 5 machines per location) and up to 20% of machines to venues with food and drink service (up to 20 machines per location). Some of the measures proposed by the Norwegian Government are likely to be effective. But research suggests that other measures may result in negative – if unintended – consequences. There is little doubt that the reduction in the overall number of gambling machines is a step in the right direction. However, the proposal to move half of the machines into locations where alcohol is served is a concern. This is because research in other countries strongly suggests that such a step is likely to result in increases in gambling expenditures and time spent gambling. Likewise, there is research showing that the placement of large numbers of machines in locations isolated from the community may result in reductions in informal social controls and lead to increases in problems. Finally, while the imposition of a monopoly on gambling machines may seem good in theory, in other countries such monopolies have often led to conflicts (and concessions) as politicians and government operators juggle the imperative to generate revenues with their responsibility to protect the vulnerable. In response to the new law, Norsk Lotteridrift (NLD) – one of the largest gambling machine operators in the country – brought suit against the Government in the Norwegian courts as well as in the courts of the European Free Trade Association (EFTA), where Norway is a member. The court cases focus on the imposition of a monopoly and the question of whether such a measure is necessary and proportionate in achieving the goal of protecting consumers from developing gambling problems. Initial rulings in favor of NLD were appealed by the Norwegian Government and ended up in the EFTA Court of Justice. The EFTA court decision has just been announced in favor of the Norwegian Government. This means that NLD and other private operators of gambling machines in Norway will have to shut down their operations by the end of June. The new gambling machine regime - with machines owned and operated by the government agency, Norsk Tipping - will be introduced in Norway in July 2007. However, there is likely to be a hiatus of several months before the new machines become operational. What is unclear is whether the new prevalence survey presently underway in Norway will permit comparisons with prevalence rates from the earlier surveys carried out in Norway and whether the Norwegian Government has plans to assess the impact of the hiatus in gambling machine availability on rates of problem gambling and help-seeking in Norway. Dr. Rachel Volberg, President of Gemini Research, has carried out two assignments on behalf of NLD. The first assignment entailed an appearance as an expert witness in the Oslo Court of Appeals. The second assignment involved analysis of a report of a new problem gambling prevalence survey in Norway, funded by Norsk Tipping and carried out in 2005. In 2006, Dr. Volberg argued for an international meeting to help ensure that Norwegian gambling policy would be informed by the best available research from within Norway and internationally. NLD agreed to guarantee funding for the event and the symposium was held in Oslo on October 16. Presentations made at the symposium and a summary of the day’s discussions are posted here along with several letters to the editor of Aftenposten, one of Norway’s largest newspapers. In 2005, a new survey of gambling problems – funded by Norsk Tipping and carried out by MMI Synovate – was completed in Norway. Drs. Volberg, Abbott and Munck reviewed the report and concluded that the MMI study contained serious technical flaws which meant that the results could not be generalized to the wider population. The MMI report and the critique are available here along with a response from the report's authors and several letters to the editor of VG, one of Norway’s newspapers. In 2005, Drs. Volberg and Abbott prepared a technical report reviewing scientific evidence related to the proposed new gambling machine regime in Norway. This report examines the relationship between gambling machine availability and problem gambling prevalence, the question of government ownership of gambling operations, the relationship between gambling and alcohol consumption and the most effective approaches to regulating legal gambling.